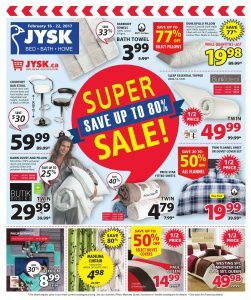 SUPER SALE has started on JYSK Flyer February 20 2017 ! When you check it out , you will reach amazing saving options up to 80% ! Many home essentials are on discount now. If you want to redesign your home and you are looking for stylish and new design products , you are looking at correct address now ! Nearly everything for home can be found here. Let’s make a shopping list and get your essential at reasonable prices. Here you go ! Their credit card helps about payment ways. You can split all your purchase to 12 equal months. When you spend more $200 you can get benefits of Credit Card. For mattress, windows, home decoration and bedding you can choose JYSK always. You can’t imagine a home without pretty decorations. Let’s make your home glorious again with them. Today is perfect for shopping, let’s go outside and renew your home with winter collections of their great products.